B cells, also known as B lymphocytes, develop from hematopoietic precursor cells which play a central role in the immune-pathogenesis of glomerulonephritides and transplant rejection. B cells can secrete antibodies through multiple mechanisms and their antibodies are the central elements of humoral immunity which against an almost unlimited variety of pathogens. In addition to that, B cells contribute to disease pathogenesis by providing costimulation and cytokines to T cells. B cells also play an immunomodulatory role in regulating the immune response by secreting cytokines that inhibit disease onset and progression. B cell–targeted approaches for treating immune diseases of the kidney and other organs have gained significant momentum. However, much remains to be understood about B cell biology in order to determine the timing, duration, and context of optimal therapeutic response to B cell–targeted approaches. B cells are primarily generated from hematopoietic stem cells (CD34+CD19−) in the bone marrow (BM), except for B1 B cells. While B cells maturation occurs in stages characterized by successive rearrangements and expressions of IgH and IgL gene segments. The antigen-recognition molecules of B cells are the immunoglobulins (Ig). These proteins are produced by B cells in a vast range of antigen specificities, each B cell producing immunoglobulin of a single specificity. The human B cell developmental program includes the expression of CD19, the regulated expression of recombination-activating genes (RAG-1, RAG-2), and terminal deoxynucleotidyl transferase. In the earliest B cell lineage, committed precursors (pro-B cells) Ig gene genes exist in a germline configuration. Early B cell factor 1 (EBF1) is one of the key transcription factors required for orchestrating B cell lineage development. Functional Data Independent Acquisition (DIA) analysis of differentially expressed proteins showed that EBF1 heterozygosity resulted in the deregulation of at least 8 transcription factors involved in lymphopoiesis and to the deregulation of key proteins playing crucial roles in survival, development, and differentiation of pro-B cells. During the differentiation of pro-B (CD34+CD19+) cells into pre-B (CD34−CD19+) cells, a rearrangement in the heavy chain locus begins in early pro-B cells via a somatic recombination of the DH to JH (IgH diversity segment to IgH joining segment). This which typically occurs at both alleles of the heavy-chain locus, at which point the cell becomes a late pro-B cell. And then a successful rearrangement means the cell progresses to become a pre-B cell. A rough estimate of the chance of generating a pre-B cell is thus something less than 55%. Once these rearrangements are successfully completed, transcription begins and a mature mRNA encoding the μ heavy chain is produced, which accumulates in the cytoplasm. Immature B cells exit the bone marrow and enter the blood to complete their maturation program in secondary lymphoid tissues, preferentially in the spleen. These immature B cells are known as transitional T1 B cells (IgM+CD10+). Next, cells enter the follicles and acquire cell-surface IgD and CD23, as well as the ability to recirculate. The signaling capability of the pre-B cell receptor depends on its further association with Igα and Igβ, two invariant accessory chains that also attend the mature B-cell receptor. Nevertheless, they still carry markers of immaturity and are thus known as transitional T2 cells (IgM+, IgD+, CD10+). Transitional T2 cells then finalize their maturation process and give rise to mature naive B cells (IgM+IgD+CD10−). The signaling capability of the pre-B cell receptor depends on its further association with Igα and Igβ, two invariant accessory chains that also attend the mature B cell receptor. Once the immature B cells leave the bone marrow for the periphery and undergo the aforementioned transitional stages, they develop either into marginal zone B cells or into follicular B cells. It takes about 1 or 2 weeks for original B cells to become mature B cells, during which they randomly rearrange their Ig genes to generate Ag-specific B-cell receptors (BCRs) capable of recognizing a wide variety of Ags. Each B cell produces a single species of antibody, each with a unique antigen-binding site. The sequence of expression of cell surface receptor and adhesion molecules which allows for differentiation of B cells, proliferation at various stages, and movement within the bone marrow microenvironment. Immature B cell leaves the bone marrow and undergoes further differentiation. 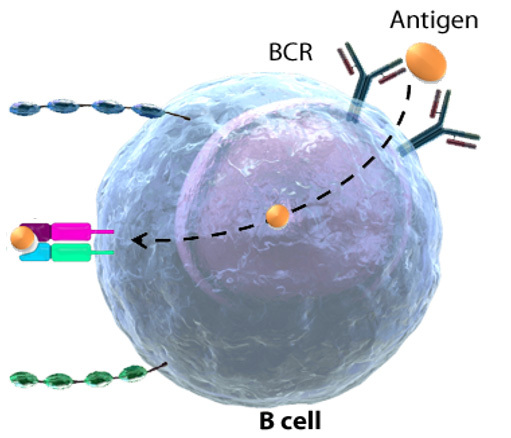 When a naive or memory B cell encounters antigen in an environment and the aid of a T cell, BCRs stimulation induces B cell differentiation into an antibody-secreting effector cell. Such cells make and secrete large amounts of soluble (rather than membrane-bound) antibody, which has the same unique antigen-binding site as the cell-surface antibody that served earlier as the antigen receptor. Effector B cells can begin secreting antibody while they are still small lymphocytes, but the end stage of their maturation pathway is a large plasma cell, which continuously secretes antibodies at the astonishing rate of about 2000 molecules per second. Plasma cells seem to have committed so much of their protein-synthesizing machinery to make an antibody that they are incapable of further growth and division. Although many die after several days, some survive in the bone marrow for months or years and continue to secrete antibodies into the blood. It is a general rule in adaptive immunity that naive antigen-specific lymphocytes are difficult to activate by antigen alone. Naive T cells require a co-stimulatory signal from professional antigen-presenting cells; naive B cells require accessory signals that can come either from an armed helper T cell or, in some cases, directly from microbial constituents. Antibody responses to protein antigens require antigen-specific T cell help. B cells can receive help from armed helper T cells when antigen bound by surface immunoglobulin is internalized and returned to the cell surface as peptides bound to MHC class II molecules. Armed helper T cells that recognize MHC complex then deliver activating signals to the B cell. Thus, protein antigens binding to B cells both provide a specific signal to the B cell by cross-linking its antigen receptors and allow the B cell to attract antigen-specific T cell help. These antigens are unable to induce antibody responses in animals or humans who lack T cells. After several days, the primary focus of proliferation begins to involute. Many of the lymphocytes comprising the focus undergo apoptosis. However, some of the proliferating B cells differentiate into antibody-synthesizing plasma cells and migrate to the red pulp of the spleen or the medullary cords of the lymph node. The differentiation of a B cell into a plasma cell is accompanied by many morphological changes that reflect its commitment to the production of large amounts of secreted antibody. Plasma cells have abundant cytoplasm dominated by multiple layers of rough endoplasmic reticulum. The purpose of the germinal center reaction is to enhance the later part of the primary immune response. Some germinal center cells differentiate first into plasmablasts and then into plasma cells. Plasmablasts continue to divide rapidly but have begun to specialize to secrete antibody at a high rate; they are destined to become nondividing, terminally differentiated plasma cells and thus represent an intermediate stage of differentiation. These plasma cells will migrate to the bone marrow, where a subset of them will live for a long period of time. Plasma cells obtain signals from bone marrow stromal cells that are essential for their survival. These plasma cells provide a source of long-lasting high-affinity antibody. Other germinal center cells differentiate into memory B cells. Memory B cells are long-lived descendants of cells that were once stimulated by antigen and had proliferated in the germinal center. These cells divide very slowly if at all; they express surface immunoglobulin, but do not secrete antibody at a high rate. Since the precursors of memory B cells once participated in a germinal center reaction, memory B cells inherit the genetic changes that occurred in germinal center cells, including somatic mutations and the gene rearrangements that result in isotype switch. The signals that control which differentiation path a B cell takes, and even whether at any given point the B cell continues to divide instead of differentiating, are unclear. B cells contribute to disease pathogenesis in autoimmunity and alloimmunity by presenting antigens as well as providing costimulation and cytokines to T cells. Vertebrates inevitably die of infection if they are unable to make antibodies. Antibodies defend us against infection by binding to viruses and microbial toxins, thereby inactivating them. The binding of antibodies to invading pathogens also recruits various types of white blood cells and a system of blood proteins collectively called complement. The white blood cells and activated complement components work together to attack the invaders. The immune system has to discriminate between B lymphocytes capable of producing protective antibodies directed against pathogens versus those that produce harmful autoantibodies. Mantle Cell Lymphoma (MCL) is a B cell aggressive neoplasia accounting for about the 6% of all lymphomas. The most common molecular marker of clonality in MCL, as in other B lymphoproliferative disorders, is the ImmunoGlobulin Heavy chain (IGH) rearrangement, occurring in B-lymphocytes. The introduction of new drugs and therapeutic schedules have improved the clinical outcome of patients affected by the hematologic disease, especially in B cell lymphoma. Despite the significant therapeutic progresses reached, several patients still relapse and die due to the emergence of resistant new clones. Based on these reasons, molecular markers detection at diagnosis and early identification of patients at high risk of relapse during the natural history of the disease are the major objectives of the current onco-hematology translational research. Therefore, a relevant challenge is to support the clinical therapeutic decisions through the identification and the monitoring of the clonal subpopulations in a prospective way, using methods that quantify residual tumor cells beyond the sensitivity level of routine imaging and laboratory techniques. Alberts, B.; et al. Molecular biology of the cell. 2002. Engel P.; et al. Therapeutic targeting of B cells for rheumatic autoimmune diseases. Pharmacological Reviews. 2011, 63(1): 127-156.